The potential of the Macadamia tree as an environmentally friendly alternative to slash and burn agriculture is incredible. For example, if you compare the Macadamia tree with a pine tree, the tree most often used in reforestation projects in Guatemala, you will see that the Macadamia tree, thanks to its broad leaves, has the capacity to convert more carbon dioxide to oxygen than the pine needles can. For every pound of nut meats we take one pound of carbon out of the air. The Macadamia tree converts sixty three cubic feet of carbon dioxide and releases 55 gallons of water vapor into the atmosphere every day. Most importantly, the Macadamia tree is an economically favorable tree, a food source, and firewood for cooking. 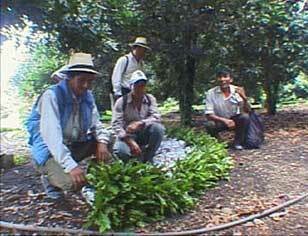 It is environmentally friendly, but it can also provide the indigenous communities an income. Macadamias are a medium sized evergreen tree of the Proteaceae family. The leaves are a glossy dark green and flowers appear as tiny florets during peak flowering. They can produce a heady perfume. The Macadamia trees have a harvest all year round with a peak from September to the end of February. The fruits have a dark green husk and are about 40mm in diameter . Inside of this is a spherical nut 15-35mm in diameter that has a very hard brown shell. Inside the nut is the edible part that has a subtle nutty flavor and a smooth but crunchy texture. The Macadamia genus consists of at least ten species, but only two of these produce edible nuts, the M. Lntegrifolia and the M. Tetraphylla. Macadamias are native only to the sub tropical rain forests on the West Coast of Queensland. Ferdinand von Muller, Royal Botanist at the Melbourne Botanical Garden, and Walter Hill, Director of the Botany Garden at Brisbane, discovered a tree in the forest along the Pine River in the Moreton Bay district of Queensland, Australia. A species of tree in the family Proteaceae previously unknown to the European and American Botanists. This species did not fit into any previously established genera in that family. So, in 1848, Muller established a new genus, Macadamia, naming it in honor of his friend and colleague Dr. John Macadam, who, sadly enough, never saw the tree or ate any of its delicious nuts. The first planting of Macadamias occurred in 1890 on the Frederickson Estate in New South Wales, Australia. They planted around 250 trees as a source of nuts for the family. Many of those trees still exist and are still producing nuts. From Australia, the Macadamia tree was brought to Hawaii by William Herbert Purvis. In Hawaii they developed the commercial varieties and clones that are used all over the world today. The Macadamia tree was brought to California by a group of agronomists who wanted to experiment with them. However, California has a very unfavorably dry and cold climate, causing many trees to die. With the few that survived they started a nursery, selecting only seeds from strong trees that had adapted well to the climate. They did this for a period of 40 years. The origin of the Valhalla trees are from this stock, further improved over 20 years. Therefore, at the Valhalla Experimental Station, we have been able to improve the genetic varieties over 60 years, giving us strong trees with high production.